In my work I clearly identify a continuum between Israel and 'Jewish ideology' ('Jewishness'). And since Israel defines itself as the Jewish State, then surely --we must be brave enough to question what Jewishness stands for. And clearly, Israelis are proud about their Jewishness -- They are far from being shy about it all. 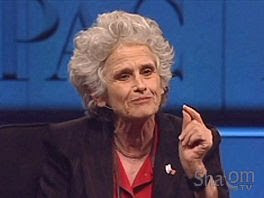 In the following video Judeo-Centric Israeli Law Professor Ruth Gavison spreads some Jewish Tribal ideas at AIPAC conference. If you ask yourself, how is it that 94% of Israeli Jews supported the IDF genocidal measures at the time of Operation Cast Lead, then Gavison may have some insights to offer. They certainly do: Israeli brutality is beyond comparison. We have to agree with the Law Professor -- Hebrew culture is, indeed, a majority culture in Israel -- because the indigenous people of the land are locked behind walls in open air prisons.